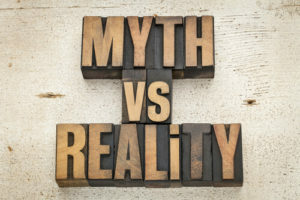 One thing I’ve learned from talking to a lot of people about real estate, is that there are some common misconceptions out there about working with Realtors. These misconceptions usually revolve around what it is we actually do, how the process works, and the nature of the Agency Relationship. In most real estate transactions there will be two real estate agents involved. The “Listing Agent” is representing the seller, and the “Selling Agent” is representing the buyer. Some of these misconceptions are about listings agents, some are about selling agents, and some are about all agents. So, without further ado, here are 5 lies you’ve heard about working with real estate agents, and a little bit of reality to go with each one. People have been hearing for years that agents get a 6% commission whenever they sell a house. However, the reality is another story. First, let’s clear up how commissions actually work. While there are typically two agents in a transaction, there is only one commission. The commission is paid by the seller to the seller’s agent, who then splits it with the buyer’s agent. So, if the commission is 6%, each individual agent’s commission is 3%. Most agents work for a brokerage that also gets a percentage of the commission. So, most agents actually end up making about 1.5% from the 6% commission. Secondly, who says the commission is 6% to begin with? There is no law or rule that says commissions have to be 6%. Commissions are entirely negotiable between the seller and the listing agent. Some agents are willing to charge less, and some actually charge more. When you hire a listing agent to sell your house, you will typically sign an exclusive contract that lasts for 3, 6, 12, or any other number of months that you two agree on. So, technically you could be legally locked in with this agent for the entire contract term. But there are exceptions. In fact, if things are not working out with your listings agent, you can ask the broker to release you from your contract. While they aren’t under any obligation to release you, most brokers and agents care deeply about their reputation. Many would rather “break up” amicably, then strong-arm an unhappy seller into staying with them. Buyers, on the other hand, hardly ever sign a contract with an agent. Sometimes a buyer finds a house right away, sometimes they look for years and never end up buying a house. The Buyer’s agent will only get paid when the buyer actually makes a purchase, and without a contract in place, the buyer is free to switch agents during their search. This is why buyer’s agents will usually want to have an initial consultation before starting down this journey with a buyer. It’s best to find out early on whether or not you are a good fit, before too much time and work has been invested. Some home buyers believe that by going through the listing agent on a home, that they will get a better deal, be better served, or have a better chance at getting the house. Here is the truth. The listing agent has a fiduciary responsibility to represent the seller’s interests, not the buyer’s. This means that the listing agent wants to, and is legally required to, negotiate the highest price and best terms for the seller. So you can see why a buyer also being represented by the seller’s agent presents a clear conflict of interest – in the seller’s favor. If a buyer uses their own agent then they won’t have to worry about this conflict of interest. A good buyer’s agent will know the best lenders, and inspectors, and will be able to spot potential red flags. As a home buyer, especially a first-time home buyer, you will definitely benefit from having a dedicated advocate on your side that knows the real estate business inside and out. Many people think of agents as a means to an end. They think you need one to buy or sell a house, and it doesn’t really matter which one you choose. Fortunately, this is not true either. Real estate is a people business, and there are as many different kinds of agents as there are different kinds of people. Some agents are incredibly knowledgeable about a particular area or particular type of property. Some agents favor building strong long-term business relationships over making a quick buck. Some agents will be your advocate, while some may try to pressure you into making a decision you’re not quite comfortable making. Some will even flat out lie to get your business. The point I’m making is that there are some very good agents and some very bad ones. There are many things that can make the difference, but the thing that makes the biggest difference is simply the willingness, desire, and work ethic to be a good agent. Yes, experience matters. But keep in mind there are plenty of “crooked” agents with plenty of experience. Oftentimes, the best way to choose the right agent for you is to simply find one you get along with personally and go with your gut. Sometimes seller’s choose to try and sell their home themselves rather than hiring a real estate agent. Many people believe that FSBO sellers are unwilling to pay your agent’s commission and therefore, you cannot use your agent to buy these homes. The truth is that most of the FSBO sellers I’ve ever spoken to were willing to pay a commission to a real estate agent representing a buyer for their home. These sellers are reasonable people and know that the vast majority of buyers are working with a real estate agent. Many of them even publicize that they are willing to pay a buyer’s agent commission as an incentive to get more agents to show the home to buyers. Posted in buying, Orange County, Real Estate, selling and tagged buying, buying a house, first time home buyer, good real estate agents, good realtor, how to choose a real estate agent, how to choose a realtor, how to find a realtor, how to sell your house, listing contract, real estate agents, real estate myths, selling, selling a house.